My ten-year-old daughter asked me this question over breakfast one morning in Chicago. We were in the city for Independence Day weekend. I was attending the Socialism 2015 conference, and she and her mom came along to enjoy some sights, do a little shopping and see a show in town. In our household, political subjects come up often in casual conversation. Our daughter has been no stranger to discussions about social justice, war and peace, union advocacy, and more. When she takes an interest, we try to answer her questions as directly and honestly as we can. Oddly, this simple question had never come up. Even more oddly, I found myself at something of a loss for a simple answer. Being in a hotel filled with Socialists (along with no small number of Deadheads, in town for the last concerts at Soldier Field), we went looking for resources. We visited the Haymarket Books room, a decent sized hall that had been set up as a temporary radical book store for the weekend. Although there was an entire table of children’s books, none of them really addressed the question directly and succinctly. The folks staffing the room were kind and attentive, and seemed a bit puzzled themselves that “Socialism 101 For Kids” wasn’t among their offerings. This series of articles is my attempt to answer our daughter’s question. I hope that it will spark some discussion, and perhaps lead us, and other parents, to additional resources that we may have overlooked. We’ll eventually get to a discussion of the history of Socialist thought and struggle, the distinctions between terms like Socialism, Marxism, Anarchism and Communism, and also some of the most common criticisms of Socialism. For this article, though, I’ll stick to a fairly brief and straightforward answer to the main question, written from a Socialist point-of-view. Socialism means that we all work together to take care of each other, so that everyone has what they need. In a Socialist world, everyone would have a decent place to live, enough food to eat, clean water to drink, clean air to breathe, medical attention when they need it, warm clothes for the cold weather, a good education, and the ability to develop to their fullest potential. Under Socialism, everyone would be free and equal regardless of gender, race, nationality or religion. Everyone would be safe from oppression (being kept down or treated unfairly), exploitation (being taken advantage of) and war. This is the Socialist ideal. 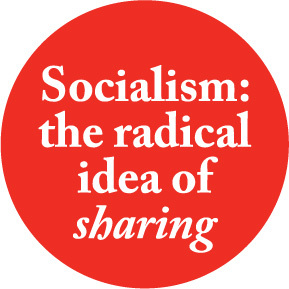 Socialism is different from our current society mainly because of two basic ideas. First, Socialism is about cooperation instead of competition. We call our current economic system Capitalism. Under Capitalism, people compete for almost everything. Individuals compete for jobs, for the best education, for housing, even for the basic necessities of life. Companies compete for funding and material resources, for customers, for new ideas and products. Whether you’re a worker or a business owner, you’re always competing, because under Capitalism there are winners and losers, and one of the worst names you can call someone in our society is “loser.” Being a loser in our society can mean that your family won’t have enough to eat. Under Socialism, instead of everyone fighting for a bigger and bigger share all the time, we would all be working together to see that everyone has at least enough. That’s the second idea that makes Socialism different from our current society. Under Socialism, the basic human needs of all people would come first. Right now, the richest eighty people in the world own as much as the poorest 3.5 billion (half of the Earth’s population) combined. Our current economic and political system puts the property of the wealthy few, and the profits of their corporations, first. So some people have everything that money can buy, and so much money left over that they could never spend it all in an entire lifetime. Yet they are encouraged to accumulate even more wealth, while 300 million children in the world go to bed hungry every night. Under Socialism, the needs of the hungry children for food would be more important than the profits and bank accounts of the wealthy. You might wonder, if Socialism is so great, why we don’t already have it. There are many reasons for this, but the main one is that the wealthy and powerful people in the world don’t want things to change. They enjoy their lives just the way things are, and our governments and laws have been set up to protect their wealth and power. So to change things it takes a lot of people, working and struggling together for a long time. The history of the past few centuries has been the history of these struggles. Socialism is a word that frightens a lot of people, especially people in America. We’ve been taught to think of Socialism as something foreign and treacherous, and to think of Socialists as people who want to do away with all of the good things about our country. Because of this fear, in the past, Socialists in America have been arrested, deported and even executed for their beliefs. You’ve probably heard the word “democracy.” The idea is simple, but powerful. It’s the idea that the people – all the people – should have the power to decide how society is run. Under democracy, the important decisions that affect people’s lives are decided by the people themselves. Our government is considered to be a representative democracy, meaning that we vote to elect representatives who then make those decisions for us, and are supposed to represent our wishes when they do. In reality, though, many of the most basic and important decisions that affect our lives are completely beyond the control of most of us. We are powerless to do anything about some of the biggest problems we face – problems such as poverty, unemployment, violence, war, climate change. The list goes on and on. What Socialists want is a true democracy, where we directly control the things that matter most in our local communities, and where we’re all active in making decisions about the larger society together. How all of this will come about, and how all of it will work, are still open questions. Socialists and others have been thinking about this, writing about it and discussing it for nearly 200 years now. The truth is that nobody has a specific step-by-step plan for putting the Socialist ideal into practice. Experiments aimed at creating a Socialist society have given us some ideas on what might work, and also on what can go wrong. We can learn from the mistakes of the past, and be inspired by the successes, but the task of creating a Socialist world is something we’ll have to work out for ourselves as we go along. Though it will be a difficult goal to achieve, many of us believe that Socialism is the only solution to the most significant and urgent problems that face us in the world today. We believe that making minor changes to the current system won’t be enough to save us as a species from the ravages of hunger, global environmental disaster and war. This is why Socialists organize and agitate and speak out and read and discuss and work and struggle together. We believe that it’s only through “all of us, working together to take care of each other” – through Socialism – that the human race will survive. A Note From Brian: I welcome comments on this article, particularly from Socialists, educators, kids and parents. I tried to keep the language as simple as I could, but I suspect that the reading level may still be somewhat too advanced for the average 5th grader, which is the primary intended audience. Ideas or suggestions for improvement will be much appreciated, as will ideas for future articles in the series. We’re other articles writte. To follow this one up? There are only two articles in the series so far, but more to come. They’ll all be at the following link. Easy to understand, thank you. Now help us get rid of our STUPID, LOW I.Q. FAKE POTUS. This is great! Thank you for this. I’ve also been searching for resources for my nine year old daughter and turning up rather empty. It’s such a child-friendly concept – we are of equal value, share, help one another. Kids take to it so naturally. Very timely. I do think we can learn a lot from our kids. :) Thanks for the kind words. Like in Britain, where when you become old, you die when you get sick or hurt, because we need to save those resources for the young people. No, thank you. We do not live in a utopian society, LOL. Resources are not distributed equally! This is a wonderful definition. I was googling ‘simple explanation of socialism’ to explain to a pupil and came across this. I am from the UK but the socialist feeling described reflects what many of us are feeling over here too. not only was this article good for 5th graders, it was perfect for me, a 74 year old, trying to grasp the true meaning of socialism. Thank you so much. I will be sharing with my grandsons. Thank you for this! An interesting and informative read for many ages. I will definitely use it when discussing socialism with my class of 11 year olds tomorrow! I thought this was a great article explaining socialism. Thanks for putting it together. I’d like to read about how you would address the controversies or apposing views of socialism to a 5th grader. Thanks so much for taking the time to read the essay, and for your comment. I love the suggestion as well. Will give a shot at writing something about common objections, controversies and criticisms at some point. “What about Stalin” comes to mind right quick. :) Thanks again! Nicely written -explained in a fairy tale way, in an ‘ideal “world but not so in reality. Just see socialism where it has been implemented as a way of life for example the latest i.e. Venezuela. No, I am one that believes achievements and efforts, should be rewarded in proportion to what one puts in – not equally . Socialism = everyone regardless of his or her achievements and efforts gets a trophy and is taken care of. Where is the fairness in that theory? No thank you. I just wanted to thank you for this. My son and I were watching old Dr. Seuss movies and he asked what socialism is… And I was kind of at a loss as to how to explain it to a kid. This was extremely helpful. I wonder how exactly does that teaching fit into Socialism? Bellamy’s racism and nativism are certainly not notions that I espouse. Your definition of socialism sound very good and appears to be a sound way to run a society. What you did not address is human frailty; that is when individuals are not challenge we often drop to the lowest common denominator. The other item you left out is there are not any true socialist societies that can be reference. Any reference you may point to are not pure socialist societies. My suggest is that individuals should learn to be productive and self sufficient and not worry about someone else paying their way. That how young people can learn to be a success. Hi there, John. Thank you for your comment. I addressed some of these criticisms in another article at this link.